I can only blame my Dad for my sickness of being a Detroit Lions fan. I have yet to find a cure for this illness. It all started on Thanksgiving Day at Tiger Stadium. Dad took me to watch the Detroit Lions play the Green Bay Packers. It was a glorious day. 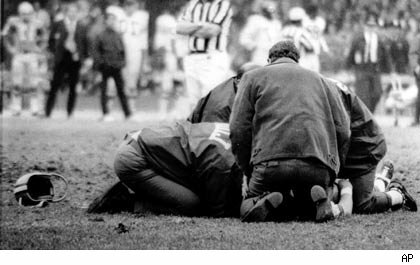 I was only seven years old, but I understood what was going on down on the field. The Lions were decimating the Green Bay Packers. The defense had sacked Bart Starr eleven times. 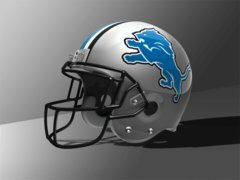 The Lions eventually won the game 28-14. Dad would never take me to another Lions game, but I was now hooked. There was only one football team for me, the Detroit Lions. Little did I know that I would follow this team for fifty years, yet never find the joy of having “my team” win the Super Bowl. The Sixties and early Seventies were the years that I followed the Lions. It was a time when the Lions had such famous quarterbacks such as Milt Plum, Karl Sweetan, Bill Munson and several others that would soon be forgotten. The most memorable play by a Lions quarterback was when Greg Landry (the best quarterback for the Lions during this era) ran a quarterback sneak for seventy-six yards against the Packers. Greg Landry would also disappoint me when the Lions lost their only playoff game in my growing up years. They lost by the unusual score of 5 to 0 against the Dallas Cowboys in 1970. The Lions have always been a team without luck. One year, I remember the Detroit Lions drafted the All-American halfback from Notre Dame named Nick Eddy. In the preseason, he returned a punt for a touchdown. The future looked bright for Nick Eddy and the Lions, but the Lions bad luck came back to haunt them when Nick Eddy had knee troubles and he never lived up to his potential. Of course, I can not list all the foibles in my experience with the Detroit Lions. I remember that one of their head coaches, Harry Gilmer, was a terrible coach. The fans said farewell to him after one miserable game with snowballs. It is good that the Lions no longer play in Tiger Stadium. It would be hard to imagine how many other coaches or quarterbacks may have been victimize by angry fans with snowballs. Being a Lions fan meant that every year, I would have some hope that this year would be the year. The opening game of 1967 the Lions played the Green Bay Packers who had won the first Super Bowl the year before. The Lions had a rookie cornerback by the name of Lem Barney. He would intercept Bart Starr three times. The Lions ended up losing their lead at settled for a 17-17 tie. I thought to myself that this would be the year. Of course, it again ended in great disappointment. Yes, the Lions had good players in my growing up years. There was Mel Farr who could run with the best of them. There was Charlie Sanders, the best tight end of his era. In the early Sixties, the Lions had a vaunted defense lead by the original Fearsome Foursome, as well as Joe Schmidt, Night Train Lane, and Yale Lary. In spite of these players and many other good players, there was never a championship. I sometimes wish that Dad had cheered for another team (like Pittsburg), but I have yet to find a cure for this ailment of being a Detroit Lions fan. I will stay a Detroit Lions fan in spite of their follies, their near misses, their tragedies, and the Ford family as owners. I must admit that my disease of being a Lions fan I have passed on to my two sons. Perhaps, when they are old, the Lions may win their first championship. Of course, I can still hope that in my lifetime, the Detroit Lions will hold up their own Super Bowl trophy. Go Lions!! P.S. Please check out my other blog in which I write about life from a Christian perspective. I have a five part series called: “Life in the Valley”.